Perspective is about clarity through optimism. This painting reminds us that challenges in life can be dissolved with a positive attitude. I am a huge believer that any difficulties can be resolved with the right approach. 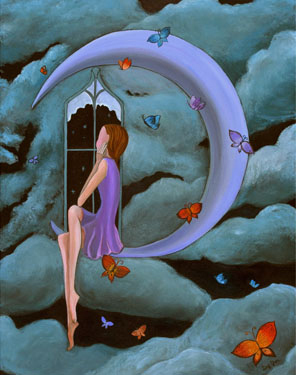 Like the painting, the girl sitting on the crescent of a moon on a cloudy night is looking through the window of her thoughts. Because of her peaceful disposition, she parts the clouds and peers through the night sky at the shinning stars, rejoiced by the company of the butterflies.